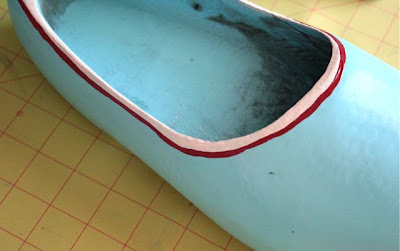 1. sand the clogs so the paint will adhere well. 3. 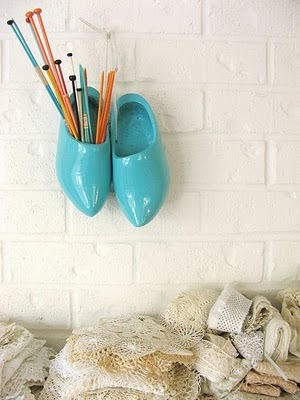 Lay the clogs on some newspaper and spray paint 2 coats (let dry in between). 4.I then painted a white strip around the rims of all 3 (2 coats). I then did a thin stripe of the burnt red-orange color, so that it would be easier to do a scallop trim without getting in to the white stripe. 5. I then free-handed some scallops (I wanted them to be irregular). If you want them to be all the same you can pre-draw them with a pencil first if you are weary of free-handing with paint. Finished! I couldn't put them up on my wall yet, because we are moving to FLORIDA in May (well I am, my husband has boards and a 1-month rotation to complete before he meets me down in West Palm Beach--where he will be doing rotations for 2 years). Anyway, I am in love with them and I can't wait to hang them on my wall and store my scissors, paintbrushes, and markers in them! I seriously LOVE this idea! Adorable! really cute idea. and have fun in West Palm- it's such a nice area! I'm from FL and my brother lives near WPB now. I have some real ones from Holland! They are super cool!! Adorable! 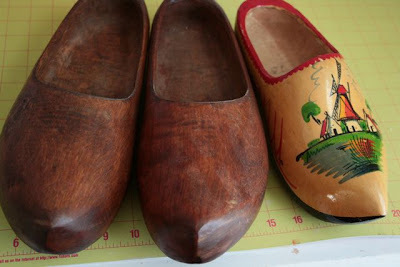 I've always had a soft spot for clogs. 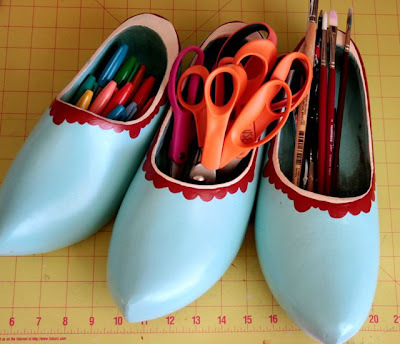 Great idea--you color choices and pattern are adorable as well. Ok I really love love love this idea! Those aqua blue shoes are so darn cute! And congrats on the next move! Two years in Florida? Yes please! I am OBSESSED with these! I need these now!! Great idea! I love this!!!!!! I may have to give this a try! Aww, those are SO pretty! I have to do this. Another item to add to my thrift/garage sale list. Thanks so much, I'll be linking. I have had that picture in my inspiration file forever! I absolutely love it! My husband and I met at Hope College in Holland, Michigan so we had some Dutch touches in our wedding including kissing Dutch people as our cake topper and wooden shoes that I wore for some of the pictures. I love this! Great idea, and i LOVE that colour! What antique mall dud you visit in STL? I just moved here and would LOVE to check it out! so sorry I don't have ANY idea where it was or what it was called!